Board by Design is a family business. We are a husband and wife team living in Carbondale, CO with our daughter. With Brad in the lead, we design much of the furniture together, and Brad makes it by hand in our workshop located in our small town, down the road from Aspen, CO. Both of us received our degrees from Arizona State University. Brad with a Master of Sculpture/Wood and Ann with a Bachelors of Art. We have both also spent all of our professional lives in the Art world. 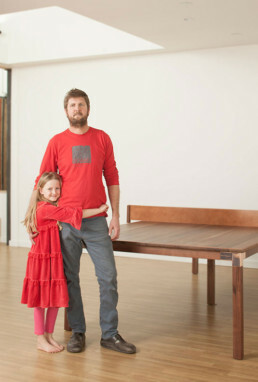 Brad immediately set up shop as a furniture designer/maker in 2002 and Ann concentrated her efforts on the non-profit sector and created a line of jewelry, before she joined Board by Design. We produce timeless furniture and accessories. Our distinctive approach is modern, playful, innovative, extremely functional and often with duality, revealing the beauty within the everyday. Our mission is to contribute to the betterment of everyday living by bring a product to you that is well designed, well made and intended to bring happiness to every user. The people we work along side of, are very important to us. When building our team the focus is always people with diverse skill sets and everyone is an Artist in their own right. Input and dialogue about a project is welcomed and encouraged.